The Freedom From Religion Foundation is deeply concerned about the nomination of Neil Gorsuch to the U.S. Supreme Court. Gorsuch, 49 years old and currently on the 10th U.S. Circuit Court of Appeals, will be the lone Episcopalian on the Supreme Court, along with five Catholic and three Jewish justices. Gorsuch's educational qualifications are excellent, but his record is disturbing. Gorsuch joined the now infamous Hobby Lobby decision by the 10th Circuit holding that for-profit companies have religious rights — a ruling that the Supreme Court upheld, allowing corporations to trample women employees' contraceptive rights in the process. According to Eric Citron at the Peabody-winning SCOTUSblog, Gorsuch "is skeptical of efforts to purge religious expression from public spaces (like Scalia)." This skepticism — antagonism would be a more accurate description — is evident in two of Gorsuch's dissents. In each instance, the 10th Circuit decided not to rehear a case that a three-judge panel had decided. Gorsuch dissented in a case that removed roadside crosses as Establishment Clause violations, when the 10th Circuit decided not to rehear the case. He wrote that it was a "biased presumption" to assume that roadside crosses erected by the government and bearing government insignia are unconstitutional endorsements of religion. Yes, Gorsuch thinks the quintessential symbol of Christianity, the cross, stamped with state symbols is not a religious endorsement. He also dissented when the 10th Circuit decided not to rehear a case that removed a Ten Commandments monument from a county courthouse in Oklahoma. In that decision, Gorsuch wrote, "public displays focusing on the ideals and history of a locality do not run afoul of the Establishment Clause just because they include the Ten Commandments." Gorsuch went on to opine, "the Ten Commandments can convey a 'secular moral message' about the primacy and authority of law, as well as the 'history and moral ideals' of our society and legal tradition." He also argued that the influence of the Ten Commandments is "undeniable" and that, quite apart from their content, Moses' tablets have become an archetypal symbol for law itself, what other courts have called "a secular symbol for the rule of law." Gorsuch goes on to list a number of other Ten Commandments displays to conclude: "the upshot . . . is that this reality does not violate the First Amendment." Gorsuch's record reveals that he cannot be trusted to abide by even well-established legal principles within state/church separation law. Federal courts, including the Supreme Court, have recognized that the Latin cross is an exclusively Christian symbol. Yet Gorsuch would have upheld Latin crosses and the Ten Commandments — which begin, I AM the LORD thy God, you shall have no other gods before me" — as not endorsing Christianity. Gorsuch also has sometimes taken an intemperate tone in public statements, Before he was a judge, Gorsuch penned an opinion piece for the National Review in which he attacked "American progressives" and "liberals" and their "overweening addiction" to "constitutional lawsuits." 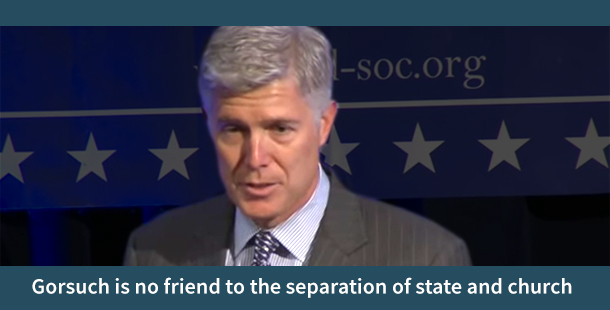 "In short, Gorsuch is no friend to the separation of state and church," says FFRF Co-President Annie Laurie Gaylor. FFRF has about a dozen ongoing Establishment Clause lawsuits, several of which may be Supreme Court-bound. The Freedom From Religion Foundation is a national state/church watchdog organization with more than 26,000 nonreligious members and chapters all over the country.